When we decided on doing a gender reveal party I knew right away how I wanted us to reveal the gender. 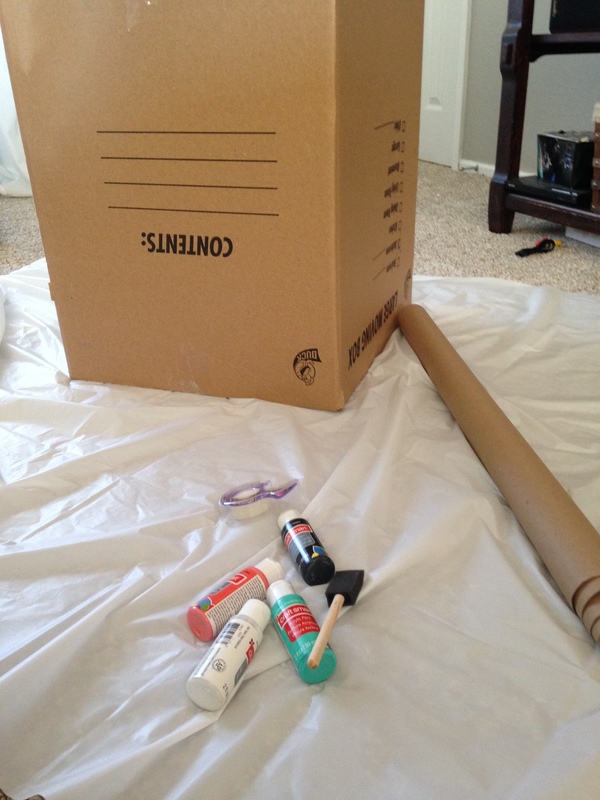 I had seen a lot of fun ideas on pinterest but none of them were really us. Neither me or my husband really likes cake at all (except cheesecake & german chocolate cake) so the cake reveal idea was out. Balloons have always been a way my family celebrated special occasions. My mom would always fill my room or bathroom with balloons (for however old I was) all the way up until I moved out. Which I think was about 27 years old. So balloons have a special place in my heart since it’s just moms memory that lives on since she passed in 2013. Since we had moved earlier last year we still had packing boxes otherwise I would have had to go out and buy one. Which by the way, boxes are expensive?!? Ummm, why? 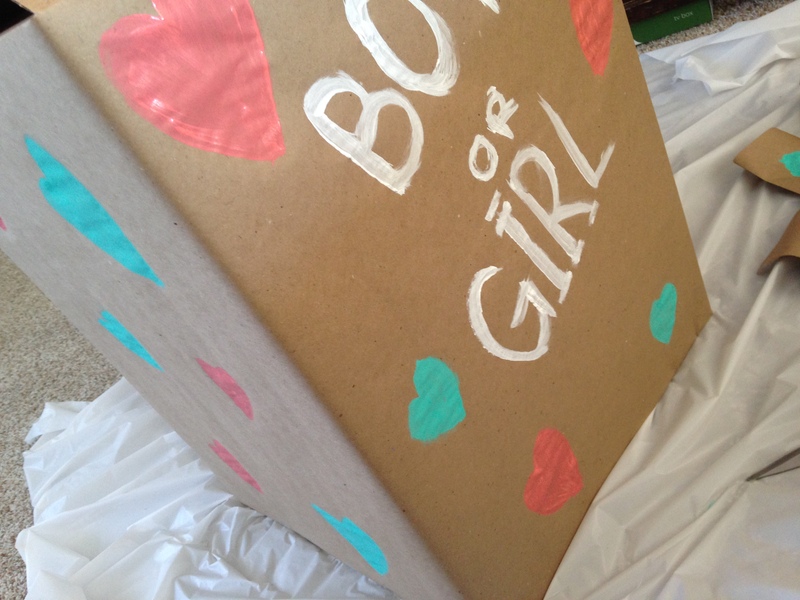 Anyways, so my first idea was to completely spray paint the box and then paint the words and hearts on it but the spray paint didn’t adhere to the box. So that was a total flop. So I went out and bought kraft paper at Target. The next day I went to the Dollar Tree and saw they had some too (head smack) so I suggest going to the dollar tree to buy yours so you don’t spend $2.99/roll like I did. 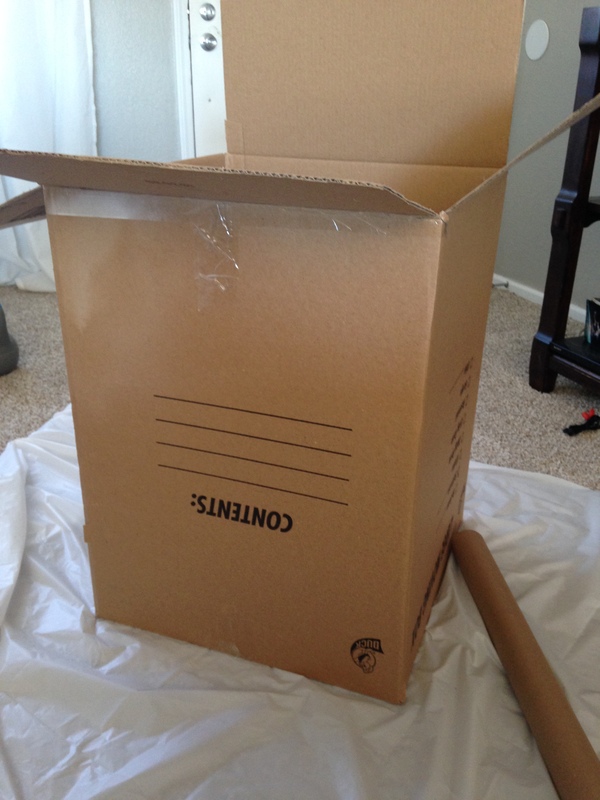 I just covered the main part of the box completely in kraft paper (except for the lid and bottom). 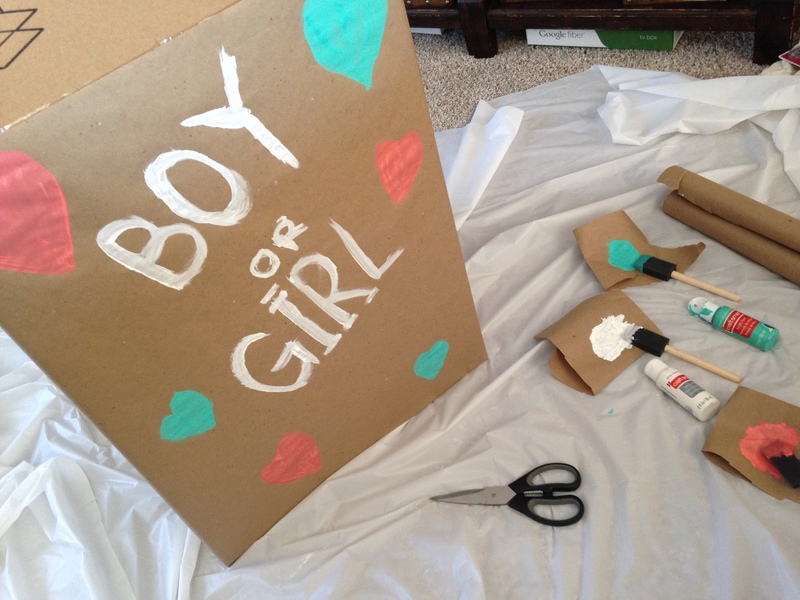 After I let the box dry I brought it over to my friends with the rest of the Kraft paper and tape and gave her the envelope with what gender it was. 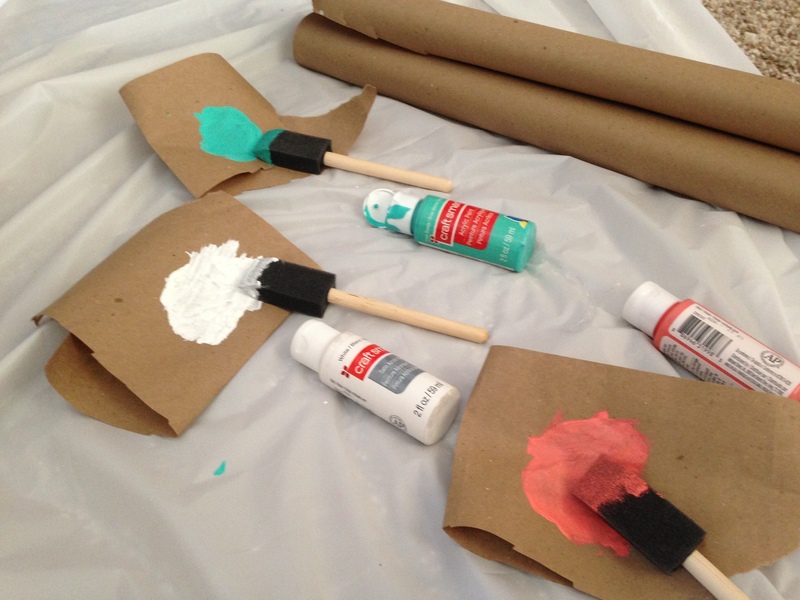 (I was so good, I didn’t peek at all:) We wanted to do teal and coral. We aren’t big on the blue and pink colors associated with boys and girls. Once she put the balloons in she just cut a square piece to go over the top and taped it off. 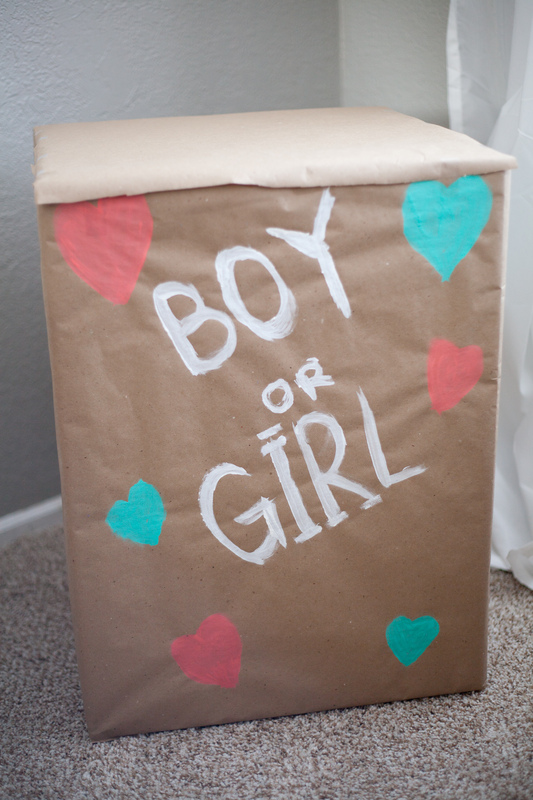 If you did a gender reveal with your friends and family what did YOU do for your gender reveal party?